J.D. Martinez hit a pair of home runs and Eduardo Rodriguez turned in one of his stronger outings of the year as the Red Sox shut out the Orioles 5-0 Sunday afternoon at Fenway Park. Rodriguez went 5.2 innings and showed a strong fastball combined with an outstanding changeup. He scattered nine hits - all singles - and didn't walk a batter for the second consecutive start. He struck out seven as his record improved to 4-1. 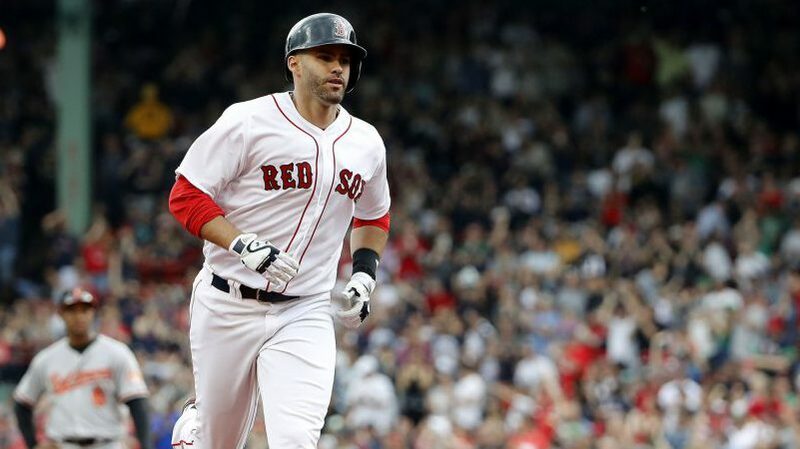 Martinez (pictured) started the Boston scoring in the bottom of the second inning by wrapping a solo home run around the Pesky Pole. The Red Sox broke the game open with four runs in the bottom of the fifth inning on two-run homers by Andrew Benintendi and Martinez. Benintendi had three hits to lead Boston and improve his average to .285. Martinez and Brock Holt each had two hits. Martinez now has 15 home runs and is tied with Mookie Betts for the Major League lead.